Planting new trees and shrubs is not a difficult job, but one to get right, if you want your new plants to have the best start in life. The most important considerations are root health, weather, soil conditions and aftercare. Planting a tree in winter. This advice is suitable for all trees and shrubs, whether containerised, bare-root or rootballed. For larger plants see our page on buying and planting specimens. Planting is best done between October and April. 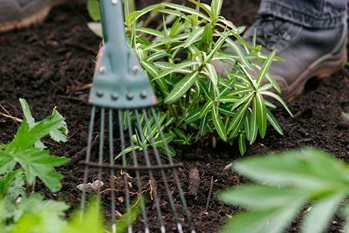 Avoid planting in waterlogged (water sitting on the soil surface or pooled in the bottom of the hole) or frozen (too hard to get the spade in) soil. Container-grown plants can be planted any time of the year, but are easier to care for if planted in autumn or winter, as they need less watering than ones planted in spring or summer. Bare-root and rootballed trees and shrubs are only available in autumn and winter. They should be planted immediately, but if this is not possible, then they can be heeled in (temporary planting in the soil to prevent the roots drying out) until planting is possible. Remove plants from containers or fabric wrapping (some specimen trees specify that the wrapping be left on under the terms of their guarantee, but normally fabric wrappings should be taken off). With the exception of magnolia and eucalyptus which resent root disturbance, trim potbound roots and spread the roots out of bare-root plants to get an idea of their spread. There is no need to trim or tease out roots from rootballs that are not potbound. Dig a planting hole that is no deeper than the roots, but is ideally at least three times the diameter of the root system. If the sides of the planting hole are compacted, break the soil up with a fork before planting. In grassed areas circular planting holes are easier to mow around, but square planting holes aid root penetration at the corners on heavy soils. A square hole within a mowing circle combines the two. Soak bare-rooted trees or shrubs for about 30 minutes prior to planting. And give containerised plants a good water before taking them out of their pots. Place the tree or shrub in the planting hole and position it so that the first flare of roots are level with the soil surface when planting is complete. With container grown plants, the top layers of compost may need to be scraped away to reveal the flare of roots. Deep planting prevents essential air movement to the root system and makes the lower trunk vulnerable to disease - this can lead to poor establishment. Insert a stake if required. Small trees do not require staking but top-heavy or larger specimens should be staked. Refill the planting hole carefully, placing soil between and around all the roots to eliminate air pockets. There is little evidence that adding extra organic matter to the bottom of the planting hole helps; in fact this practice can hinder plant establishment as the organic matter decomposes and may cause the plant to sink. Firm the soil gently, avoiding compacting the soil into a hard mass and water in. Protect from deer or rabbit damage where necessary by using tree spirals, chicken wire guards or similar. Drought stress is common with newly planted trees and shrubs. Even in a cool, wet summer, the rain rarely replenishes soil moisture stores fully. The soil may be dry around the roots even when the surface appears moist. Dry, windy conditions are especially likely to lead to water shortages. With experience, it is possible to detect the dull, lifeless foliage indicative of drought stress but by then the tree has already been damaged. Ideally anticipate water loss, and irrigate to prevent damage. Watering aids can assist watering of newly planted trees such as irrigation tubes (biodegradable tree irrigation pipe made from potato starch is available) or watering bags such as Treegator®. Overwatering is possible, especially on poor draining soils and with automatic irrigation systems, which leads to rotting roots and symptoms similar to drought. If in doubt dig down with a trowel to the side of the rootball to see if the soil is beginning to dry before watering. The quantity required will vary with soil type but typically 30-50 litres per square metre (4-6 watering cans) each week in dry weather during the growing season will be necessary. Weeds, lawns and other vegetation intercept water before it reaches the roots of newly planted trees and shrubs. Fertilisers do not need to be added at planting time but can be used a season after planting if the soil is very poor or a boost to growth is required. However, if you are using a mycorrhizal fungi (e.g. Rootgrow) do not to apply a fertiliser at all as phosphorus (found in general fertilisers and superphosphate) can suppress the fungus. Corrective pruning on misshapen trees is best carried out while the tree is still young. This may involve shortening or removing any competing leaders and removing damaged, dead or diseased wood. Lower laterals (i.e. sideshoots coming off the main trunk) may also need removing in stages over the first few years if a clear trunk is desirable. See our page on formative pruning of new trees. Inspect tree ties in spring and autumn and adjust ties to prevent constriction of the stem. After two growing seasons the tree should make sufficient root growth to anchor the tree and the stake can be removed. Planting too deep is a common cause of tree death. Poor establishment, brown leaves or general leaf damage are also sometimes encountered after planting. Newly planted trees often need protection from mice and voles, rabbits and deer to prevent being ring-barked.